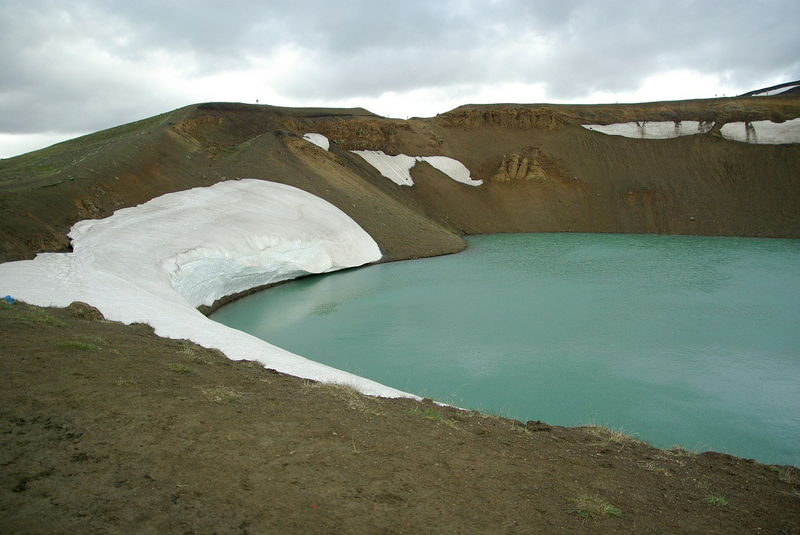 Scandinavian Travel Services offer a great opportunity to discover the most impressive places in Iceland walking from Reykjahlíð, Mývatn with two stops in Holuhraun/Nornahraun and Askja caldera. This is a long hiking tour: will last approximately 12-14 hours, and will require easy to moderate level of difficulty due to the weather conditions. Speaking of weather it is important to bring with you warm clothes, waterproof jacket and trousers, sunglasses and good hiking shoes. During the trip, you will have a chance to enjoy amazing views on Lake Mývatn, Askja caldera, Víti crater and Holuhraun lava field. The longest walk will be from Vikraborgir to Víti crater, it is a 2,5 path, that will take around 45 minutes. On the tour, you will learn about geology of the local area and the developments of the volcanic activity. After enjoying the views, we will head towards natural geothermal pools at Laugafell, where one can bathe in this amazing hot spring. The tour will cost 32,000 ISK per person, there is also 50% discount for kids. There is a possibility of a private tour, it will cost 140,000 ISK per Super-jeep. You can read more about this tour here.